anybody use one of these? Curious if it helps (or hurts) at all. I didn't know they made these. I might have to give one a try. I wonder what effect it would have with the trailer surge breaks? Good or Bad?? I bet it makes the starts and stops smoother for sure. I always get a tug when starting. Wear on the towing hitch outer sleeve? Not an east part to replace when worn. I have one and some surge brakes don't like them. On my boatmate trailer it was fantastic, my eagle trailer has an integrated damper (tiedown brand surge brakes I think) and it messed with the function of the surge brakes. Basically I heard a knocking sound like the trailer breakes were low on fluid but they weren't. I noticed the paint on the hitch and reciever wore off from it moving back and forth but the steel was fine. This was after 5 years of towing 20 miles each way just about every summer weekend. How much does it move with your tow truck and boat? If you will Slow down faster when you first start to brake and ease off the brakes as your coming to a stop it will take a lot of that tuggin away. you almost have to drive as to make sure you are still pulling the trailer when coming to a stop instead of having the trailer pushing against the vechicle trying to stop itself. The whitness marks are about 1/4 of an inch. I've used one the past 10+ years. 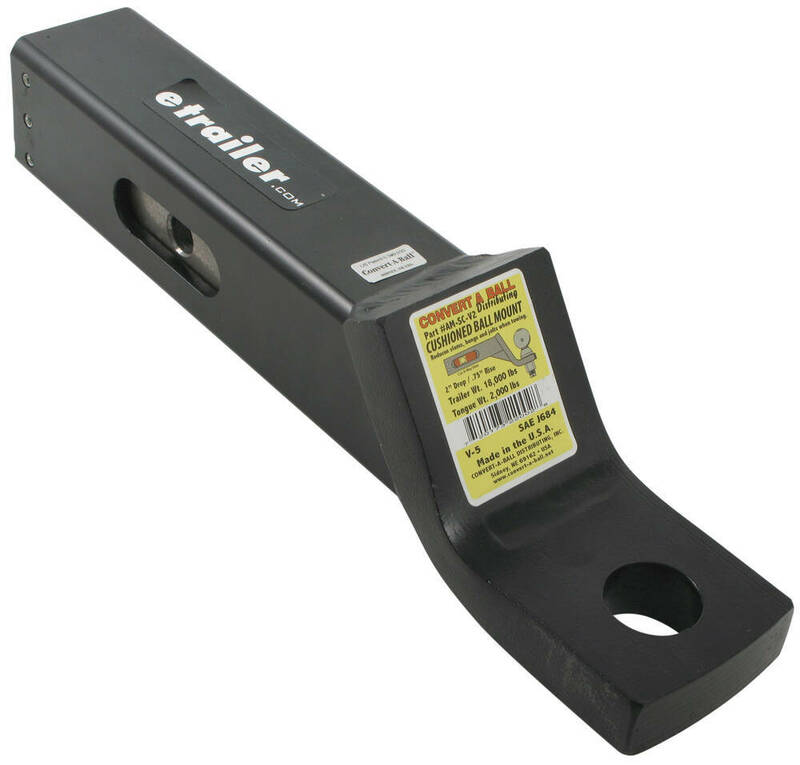 Eliminates all or almost all of that "clunk" you feel on starts and stops when towing. Definitely makes accelerating and stopping the tow vehicle much smoother. I'd put this up there like owning a box anchor as one of the best inexpensive things to make your boating more enjoyable. Used my new one this weekend. Made some noise at first but became silent after about 10 stop/starts. I like it a lot, works as advertised. Yes, but haven't been towing much. Next weekend we will though. This one linked only offers a 2" drop I need a 4". They have a bunch of different sizes.........or you can look on Amazon for Cushioned ball mount and you'll get results. Been using for a couple weeks now, the "clunk" is all but gone. Great & simple add on. Got mine for Fathers day. Softens clunks but still there. Thinking that is from the actual actuator pin on trailer bottomming out in slot at takeoff.